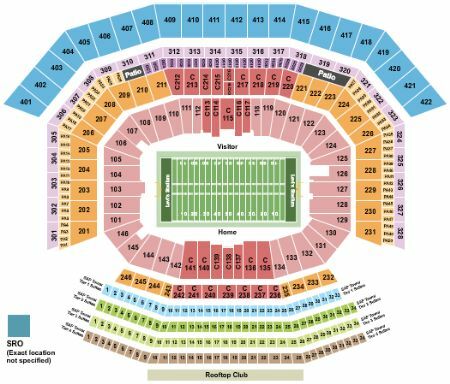 San Francisco 49ers vs. Los Angeles Rams (Date: TBD) Tickets - 12/21/2019 - Levi'stadium in Santa Clara at Stub.com! Corner end zone seats. First row in this section. XFER Mobile Entry. Scan your tickets from your mobile phone for this event. Do not print these tickets. Tickets will be ready for delivery by Dec 18, 2019. Sideline seats between the 40 yard lines. Visiting teams side. XFER Mobile Entry. Scan your tickets from your mobile phone for this event. Do not print these tickets. Tickets will be ready for delivery by Dec 18, 2019. Corner end zone seats. XFER Mobile Entry. Scan your tickets from your mobile phone for this event. Do not print these tickets. Tickets will be ready for delivery by Dec 18, 2019. Mobile Entry Tickets. Must have smart device on hand to enter event. Tickets will be ready for delivery by Dec 20, 2019. Mobile Entry Tickets. Must have smart device on hand to enter event. Do not print these tickets. Tickets will be ready for delivery by Dec 12, 2019. XFER Mobile Entry. Scan your tickets from your mobile phone for this event. Tickets will be ready for delivery by Dec 20, 2019. Third row in this section. Tickets will be ready for delivery by Dec 15, 2019. Mobile Entry Tickets. Must have smart device on hand to enter event. Do not print these tickets. Aisle seats. Tickets will be ready for delivery by Dec 20, 2019. Mobile Entry Tickets. Must have smart device on hand to enter event. Do not print these tickets. Limited view seating. Tickets will be ready for delivery by Dec 19, 2019. Mobile Entry Tickets. Must have smart device on hand to enter event. Do not print these tickets. Tickets will be ready for delivery by Dec 17, 2019. Sideline seats between the goal line and the 10 yard line. Visiting teams side. XFER Mobile Entry. Scan your tickets from your mobile phone for this event. Do not print these tickets. Tickets will be ready for delivery by Dec 18, 2019. Mobile Entry Tickets. Must have smart device on hand to enter event. Do not print these tickets. Tickets will be ready for delivery by Dec 22, 2019. Sideline seats between the end line and the goal line. Visiting teams side. XFER Mobile Entry. Scan your tickets from your mobile phone for this event. Do not print these tickets. Tickets will be ready for delivery by Dec 18, 2019. MobileQR Entry. Scan your tickets from your mobile phone for this event. Do not print these tickets. Tickets will be ready for delivery by Dec 17, 2019. Second row in this section. Tickets will be ready for delivery by Dec 15, 2019. Standard Hotel Package includes 2 nights at a hotel near the venue (check-in day before game, check-out day after game) | Upper Level game ticket in sections 401 thru 408 or 415 thru 422 (orders of three or more may be split) | Red Zone Rally pregame tailgate party featuring all-inclusive food and beverage, full service sports bar with 45 TVs showing NFL action, live entertainment and interactive games, access to the pavilion and the Flight Deck roller coaster, 49ers cheerleaders/alumni appearances and more | Gift bundle (1 per person) | Rate is based on double occupancy | Ticket upgrades and additional nights at hotel obtainable upon request |. Corner end zone seats. Second row. XFER Mobile Entry. Scan your tickets from your mobile phone for this event. Tickets will be ready for delivery by Dec 20, 2019. Deluxe Hotel Package includes 2 nights at a hotel near the venue (check-in day before game, check-out day after game) | Roundtrip airport (SFO) transfers | Lower Level end zone or corner game ticket in sections 122 thru 132 or 144 thru 108 (orders of three or more may be split) | Red Zone Rally pregame tailgate party featuring all-inclusive food and beverage, full service sports bar with 45 TVs showing NFL action, live entertainment and interactive games, access to the pavilion and the Flight Deck roller coaster, 49ers cheerleaders/alumni appearances and more | Gift bundle (1 per person) | Rate is based on double occupancy | Ticket upgrades and additional nights at hotel obtainable upon request |.